Stayed at this hotel in August 2007. There were two families holidaying. Our family consisted of two adults and three children and we were allocated a family room which was two separate rooms, one for the children, another for the adults and one bathroom, each bedroom with its own balcony. There was a maid service everyday to make up the beds and change towels. The hotel was spotlessly clean. Food was really good with a varied choice of buffet for each meal, including vegetarian. Good range of desserts as well. The food was hot and topped up as soon as it had run out. Its is about a ten minute walk to the beach, but at reception you can arrange a taxi which costs about 3 to 4 euros. The hotel is actually German owned so is predominantly German customers, we felt a bit out of if as we were one of only two British families staying there. There is entertainment at night. I would recommend this hotel, but we only had Half board but would have preferred All Inclusive which all the Germans seemed to have. We have been to the Millor Sun 4 times, this holiday was the 4th time. We have booked to go again in June 2006. I can not understand why there are no reviews of the hotel as it is a cracker. The hotel is approx 15 min walk to the centre but the location did not bother us. 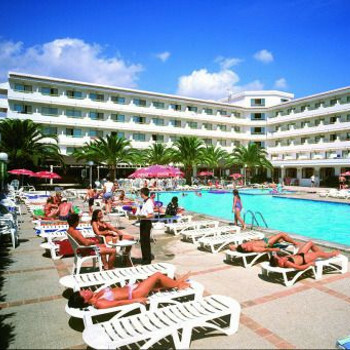 It has ample space round the pool and loads of sunbeds. The food is nice and entertainment is good although we do not always stay as the resort of Cala Millor/Cala Bona is fantastic. You can walk for ages if you want to or sit at a bar and enjoy the amazing views of the Med. There is no busy road just a lovely promenade with plenty of shops, bars and restaurants to choose from. We have made many friends in the hotel and also in the resort and we are always made to feel welcome, and the same staff work there that did when we first went 6 years ago.